BanglaCricket Article :: Lasith Malinga: A severe threat? Lasith Malinga: A severe threat? In November, Bangladesh will tour Sri Lanka. With the test series success against Zimbabwe and the astonishing batting performance in the Natwest ODI series in England, we all will be expecting a decent fight against Sri Lanka from our team. We faced Sri Lanka?s legendary bowling firepower of Chaminda Vaas and Muralitharan in our previous encounters. But this will be the first time our batting line up will face Sri Lanka's freakish new fast bowler Lasith Malinga. After watching Malinga?s bowling action for the first time against the West Indians, I certainly have the fear that this effervescent and unconventional pacer might destroy Bangladeshi batting lineup in a flurry with his freakish slingshot action. For those who haven?t seen Malinga?s bowling action, I?ve prepared a video of two overs bowled by him in the first test against West Indies. Watch this video and the related information, and you will know the damage he is capable of doing with his very unusual and fast bowling action. Lasith Malinga has been brought into the limelight not so much for his cricketing abilities, but for his distinctive and explosive round-arm, slingshot action, by which he shocks almost every batsman. He has a mixed action, landing with his hips side-on and then straightening them suddenly as he releases the ball. This is one of the most aggravated slingshot actions in world cricket. Malinga releases the ball in front of the umpire's tie, and most batsmen have a horrid time trying to pick his 140 kmph balls aimed right at their toes. At first sight, I thought "Isn?t he chucking?" Australian sports columnist Patrick Fitzgerald expressed similar doubts, ?Not for one moment am I suggesting that the effervescent Lasith Malinga is a chucker, but there was a time when I thought you actually had to deliver the ball more or less over the shoulder and not from the vicinity of the umpire's navel or sideways?? 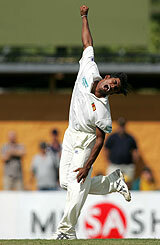 But a closer look explains that it is not an under-arm-, but an unusual side-arm bowling action. Side-arm bowling was popular in the 1800s, but world cricket have not seen much of it in the last hundred years. Underarm bowling was disallowed in the laws in 2000, but neither over arm nor side-arm is defined in the laws. John Dyson, Sri Lanka?s ex-coach, hopes that Malinga will continue to cause problems. "He's a little bit unorthodox and batsmen have trouble picking him up. We've seen it in the middle with Australia, South Africa and New Zealand; he is very difficult to pick up? Malinga, 21, was the most impressive Sri Lankan bowler in the drawn Test against New Zealand at Napier, where he took a career-best five wickets for 80 runs in the second innings, and had match figures of 9 for 210. Seven of his wickets were either bowled or LBW, as the Kiwis continually struggled to pick up his deliveries. The Kiwi batsmen even asked the umpires to remove their dark ties and change their trouser color as the ball was being delivered from in front of the umpire's chest! Umpires removed their dark maroon ties to help the batsmen pick up Malinga's point of delivery. Steve Bucknor went as much as draping a white jersey in front of his trousers. New Zealand Captain Fleming termed Malinga's case as a "unique" situation and added: "We found it extremely tough to pick him up. We've asked for the umpire?s uniforms to be changed.? Fleming told the AFP news agency "We can't see him", describing how the New Zealand batsmen were finding it almost impossible to pick up the ball from Malinga. I am sure the Bangladeshi batsman will eventually get accustomed to his bowling action, but how long they willl take for this adjustment is the main concern. Australia, South Africa, New Zealand and West Indies ? the batting lineups of all those countries had trouble reading Malinga?s bowling. Our batsmen are now up for this new Malinga challenge and they should do their home work. This page has been viewed 12076 times.